Drug-testing companies run the gamut from brand new to highly experienced and certified. It’s sometimes difficult to gauge the relative quality of vendors because they tend to say many of the same things. 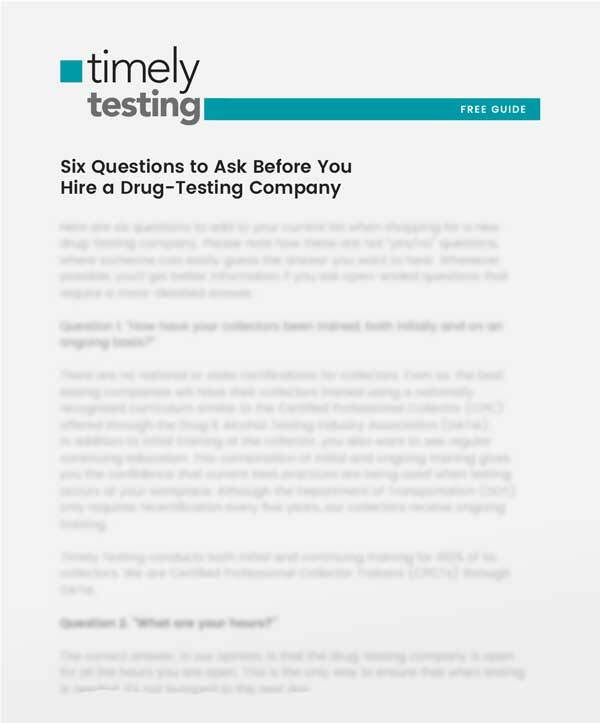 Our guide gives you six crucial questions to ask any drug-testing company before you decide to hire one. Hiring the right company takes the stress out of the drug-testing process and also protects your bottom line. Whether you’re new to drug and alcohol testing, or have been doing it for a while, you need to know about some critical blunders to avoid. We’ve seen businesses suffer when well-meaning people made these mistakes. What kind of mistakes? An employee’s supervisor could ask a seemingly innocent question that creates liability for you. At the same time, there are certain simple actions that we suggest you take at the right time, in order to protect yourself and your company. Our guide spells out these mistakes and how to avoid them.